We have been part of the Deborah Thomson School of Dance for over 7 years progressing from the beginning classes to the Competitive dance team. Our Daughter has built lasting relationships with teachers, other dancers and their families while learning dance technique and choreography. She has excelled in many areas of dance such as Tap, Acrobatics and Musical Theatre with the help of her amazing, talented and hardworking teachers. The Deborah Thomson school of dance team makes you feel like you are part of the family and they really do care about their students. They offer a variety of dance classes and levels to suit kids and adults of all ages. Come join a dynamic, creative, hardworking and family oriented Dance Studio “ Go Team Go”!!!!! "Being at DTSOD has made my daughter a confident, outgoing and happy child. She has made many friends and memories that will last a lifetime and I am so proud of the young lady she has become because of dance."      My kids have been going to DTSOD for 10 years and they have loved every moment. I started them off slowly with only 1 class each but before you knew it they wanted to take more classes! The dance teachers are wonderful and treat them like their own children. They are very friendly and patient with them! They have turned them into beautiful dancers and it is an absolute joy to see them perform on stage!!! They have been the #1 studio at several competitions! The kids are absolutely bored when they are not there. Thank you DTSOD for always being there for them & turning them into little STARS ?      My daughter has been dancing at Deborah Thomson School Of Dance for 8 years now. She started off as a shy girl, but that didn't last long with the help of the friendly and comforting dance teachers. This dance school is like one big family with all the kids that run and greet each other at EVERY dance class as though they haven't seen each other for years! Every year I wonder what dance routine will they do now thinking I've seen it all, but every year I get surprised at the GREAT routines they do. I just want to thank all the teachers at DTSOD for all the hard work you put in year after year and for grooming our kids to be the best dancers they can be! Go team! My granddaughter has been with the Deborah Thompson School of Dance for over a decade.      Studying the many different dancing styles offered, growing from a recreational student to an award-winning competitive dancer. Over the years, she has made lasting friendships and strong bonds with the other dancers and teachers. There is always a jovial and encouraging atmosphere back stage and in the classrooms. Along with the other parents, I am glad there is a dance studio that teaches proper technique while allowing the children to still have fun. When I first heard that my son could be taking dance lessons, I got very excited. He was always dancing around with me and seemed to love music! A friend from work told me about Deborah Thomson School of Dance. They said that there was always a need for boys in dance. And the incentive was to let him try it and enjoy the fact that the boys were taught at half price. We never looked back since. Our lives became filled with lessons, amazing recitals, wonderful new friendships and trips out of town for competitions. The teachers were all positive influences in my son’s life. I have watched many children grow over the past 6 years, and they have accomplished many goals. My son has made many friends who are now high school art students. They all have the one common JOY OF DANCE! My younger son enjoyed being there too and now I dream of watching both of them perform on stage! Thank you DTSOD for the years of providing dance happiness for our kids! Deborah Thomson’s School of Dance.......      I have been in attendance at this dance studio since it first opened. Back then I was a 10 year girl and the lessons that I learned were ones that lasted me a life time. Not only was dance a place where I was able get healthy and move, but it gave me confidence to showcase myself as a person. I feel more strongly about this today! I am now a mother of a 6 year girl who is very shy and has had trouble coming our of her shell. It has been through the guidance of Deborah Thomson and her team, that my daughter has been able to get up on stage and showcase her talent. 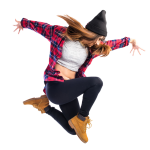 Deborah Thomson’s School of Dance is and has always been and positive, inclusive, healthy environment where kids of all ages are able to be themselves, have fun, be healthy and learn to dance!! !